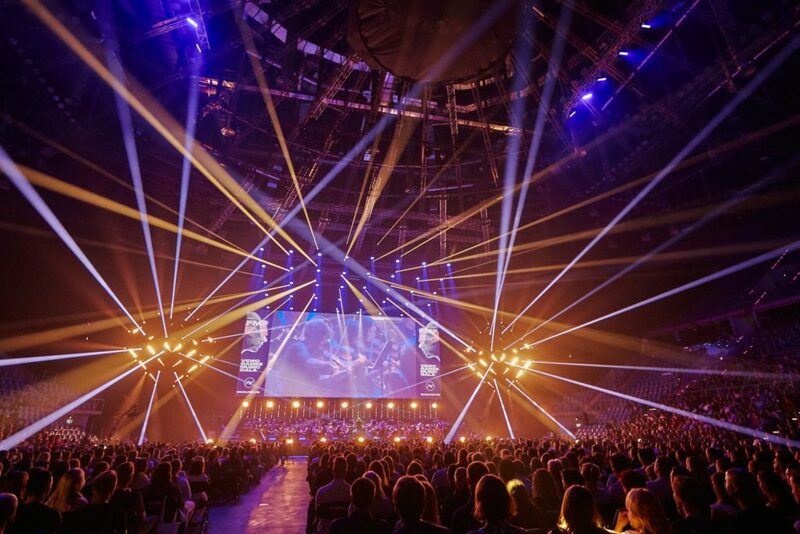 Every year the Film Music Festival in Krakow, Poland, includes a big concert in the city’s sports arena. The theme for this year was music from video games. 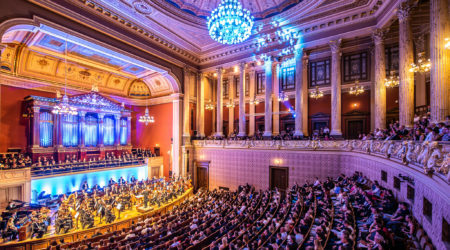 Traditionally, many composers are invited to these concerts and this year was no exception. The main guests were Jesper Kyd, Christopher Drake, Richard Jacques, Piotr Musiał, Marcin Przybyłowicz, Mikołaj Stroiński, Eimear Noone, Austin Wintory and Elliot Goldenthal (who has not actually composed for a game yet, but we will come to that later). The responsibility of conducting the orchestra and choir was given to Ludwig Wicki, who is a regular of the festival. After a beautiful start with Michael Giacchino’s Medal of Honor, which he had composed before he started his huge Hollywood career, we could listen to Silent Hill, which was dedicated to Daniel Licht, who passed away last year. Licht’s musical partner, Norman Kim, performed on stage using his voice and a mandolin, accompanied by Tina Guo with her electric cello, for this amazing piece: it was fast-paced, with heavy metal elements, and a fantastic ending. The following track, Journey, stood out in stark contrast. Composer Wintory walked on stage together with Guo, who would be using a regular cello for this piece. The beginning of the suite was such a privilege to witness since Tina Guo is the one who played the original recording of this beautiful theme and was allowed to extend it with her own improvisation. When she was done, Wintory started to conduct the orchestra for the rest of this gorgeous suite. ABZU, which followed, was just as beautiful. For Wintory’s final piece Sara Andon came on stage with her flute, and together they played music from Assassin’s Creed: Syndicate. The music from this game is very joyful and that could also be heard in Andon’s play. After a bombastic piece from Headhunter by Richard Jacques, it was time to announce the winner of the FMF Young Talent Award. The contestants had to write music to a gameplay sequence from the game James Bond: Blood Stone. 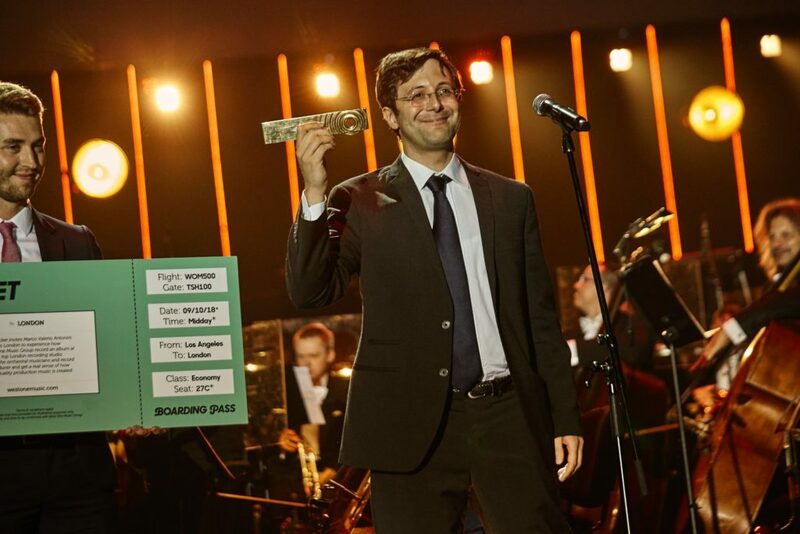 The winner of this year was Marco Valerio Antonini, an Italian composer who now lives in California, where he already is composing for movies and games. He has already won some awards in recent years and he can add this one to his collection as well. SoundtrackFest has conducted an in-depth interview with Antonini, which is a fantastic source if you want to know more about him and the award. Afterwards, we could hear Jacques’s own interpretation of the music from the game, which sounded very Bond-like with a fast pace and screaming trumpets. 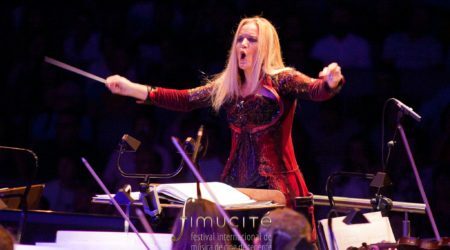 Like during Fimucité, was Eimear Noone conducting her own “Malach, Angel Messenger “ from World of Warcraft: Warlords of Draenor. It is such a marvelous piece, where you can witness her energetic conducting and to enjoy the music played by the orchestra, the choir and all the pre-recorded musicians on the big screen. Noone’s second piece was a song from a game that has not been released yet called Runes of Aran, where vocalist Anna Karwan sang her part beautifully over long melody lines from the orchestra. Before the announcement of the Ambassador Award, which was won by the game developers of CD Projekt Red, we could enjoy the jazz music from Phantom Doctrine, written by Jan Sanejko and Marcin Przybyłowicz. 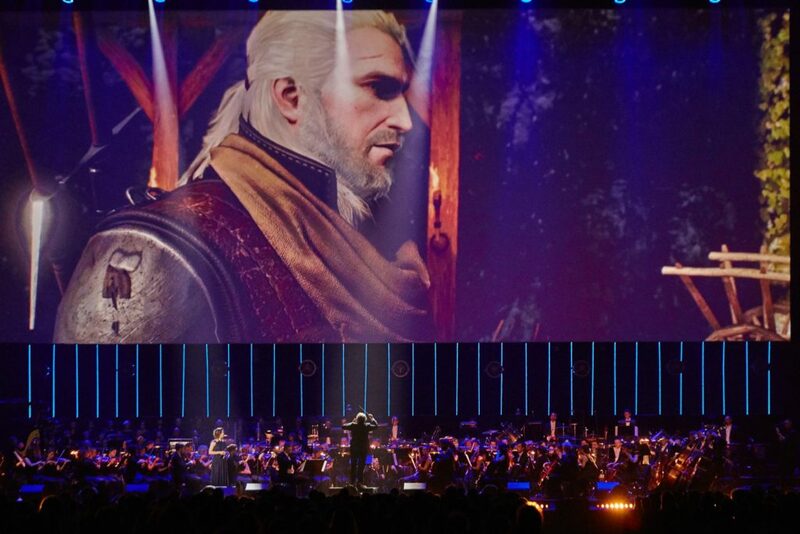 When the award ceremony was over, we could listen to a suite from The Witcher III. I have listened to this music quite often, and I really enjoyed Karwan singing in this performance. The music of Jesper Kyd came next, with which I am very familiar but which I had never experienced live. I really liked “Ezio’s Family” with its amazing and simple melody line and with Karwan singing. The suite from Assassin’s Creed 2 and Assassin’s Creed: Brotherhood was fantastic as well with Guo joining Karwan on stage with her electric cello. The suite with music from Hitman 2 and Hitman: Blood Money that followed was an awesome example of what the production has done with the screen for this concert. It showed a mixture of images inspired by the games as well as the musicians and blended with live videos of the orchestra playing. For this suite, for example, we saw the hitman’s weapon closet with instruments instead of weapons and Ludwig Wicki had been marked as a target to be assassinated. It also made the suite interesting to watch next to listening to the beautiful music. Afterwards, it was time for Goldenthal’s piece. Like I stated in the beginning, up to now he has not written any music for games. He has written for the animation movie Final Fantasy, however, which is also a gaming franchise. For the FMF he had arranged a new suite from that movie, which was premiered at this concert. Personally, it is my favorite score from Goldenthal and it was just an amazing experience to hear this music live, especially the beautiful and delicate theme, but also the magnificent ending with a huge brass section, including eight French horns, creating a massive wall of sound. The concert ended with the music of Christopher Drake. He has written two suites with music from Batman: Arkham Origins, which sounded very dark, and made me think of Danny Elfman’s Batman music. Especially “Villains Suite” had some very powerful sounding melodies and themes. When this concert was announced, and when I heard more details of what I could expect from the program, I was a bit doubtful if I would like it or not. I had the impression that I would be missing some pieces from games that are very famous but would not be performed that evening. Nevertheless, the whole evening was a very enjoyable experience for me, with a lot of new music that I had not heard before. 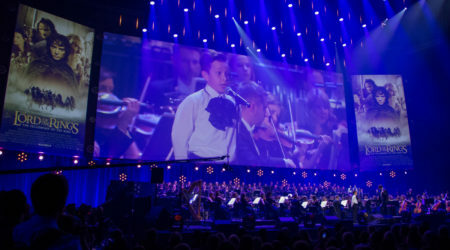 Next to the music, the images on the screen, where they blended live footage of the orchestra with images inspired by the game, were entertaining to watch. The guest line-up was also very strong this year with big names who write music for video games, and, of course, with Elliot Goldenthal. It must be quite a challenge to fill an arena for a concert like this, but again, the organization has pulled it off. I am quite curious what they will come up with for next year’s gala, but with their history and experience, it will probably be worth attending.